This photo was sent to me by Mike Townend of Towneley Hall. It is from a collection owned by S Foster of Harle Syke. 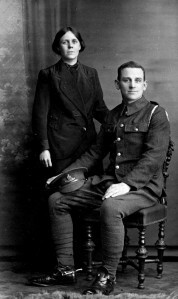 Unfortunately the name of the soldier and his companion is unknown. Please contact me if you can put a name to either of these faces.